Strong, flexible strapping replaces steel strapping for medium- to heavy-duty loads and rigid palletizing. 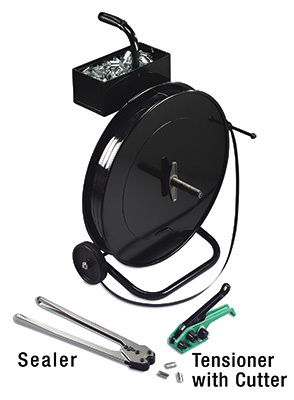 Deluxe system includes portable heavy-duty cart, 5,800' coil of 1/2" strapping, 500 seals, sealing tool, and heavy-duty tensioner with cutter. 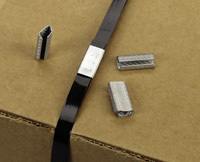 Paperboard and plastic edge protectors are available for extra pallet support.